For the first time, Samford University is starting homecoming weekend with alumni teaching classes in their former departments throughout campus. On Thursday, Nov. 5 nine schools are inviting back an alumnus to speak in their classes. Alumni were chosen because of the interesting and impactful ways they have used their degrees, and come from all over the country, according to Lauren McCaghren, Samford’s senior director of alumni programs and annual giving. “We have so many alumni who do cool things. We want to give students an opportunity to be aware of them and to be exposed to the connections they can make,” McCaghren said. Each school has its own itinerary, but all alumni will be sharing their post-graduate experiences. The speakers will give career advice to the students that sit in their old classrooms. The Howard College of Arts and Sciences featured alumna is Mary Kathryn Covert Steel ’07, director of U.S. Media Relations and Public Affairs at Sanofi, Raritan, New Jersey. The Cumberland School of Law featured alumnus is Sean S. Modjarrad J.D. ‘00, managing shareholder, Modjarrad Abusaad Said Law Firm, Richardson, Texas. The Ida V. Moffett School of Nursing featured alumna is Frances Ford ’79, executive director, Sowing Seeds of Hope and Healthcare Coordinator for Perry County, Marion, Alabama. The McWhorter School of Pharmacy featured alumnus is William C. Davis ’87 of Franklin, Tennessee, national clinical account director, AstraZeneca Pharmaceuticals. The Brock School of Business featured alumna is Laura Kelly ’78 of San Antonio, Texas, a senior vice president and chief product and data solutions officer, Dun & Bradstreet, New York. The School of the Arts featured alumnus is Abdullah B. Birdsong ’05, founder and lead pastor, Dunamis Church, Charlotte, North Carolina. The Orlean Bullard Beeson School of Education featured alumna is Julie Hannah Ed.D. ’01 of Gardendale, Alabama, former director of the Office of Student Learning, Alabama State Department of Education. The School of Health Professions featured alumnus is family physician and medical missionary Ryan Rainer ’95. 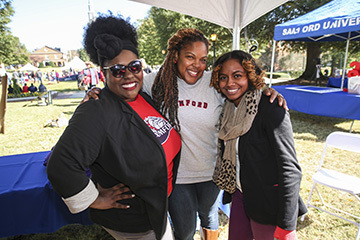 A full weekend of Homecoming activities is scheduled Nov. 5-8.